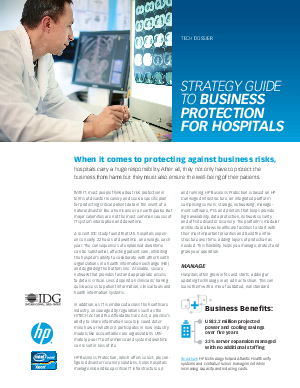 Learn more about HP Business Protection, which offers select, preconfigured disaster recovery solutions, helps hospitals manage risk and keep critical IT infrastructure up and running. HP Business Protection is based on HP Converged Infrastructure, an integrated plataform comprising servers, storage, networking, management software, PCs and printers that helps provide high availability, data protection, network security and off-site disaster recovery. Intel, the Intel logo,and Intel Inside are trademarks of Intel Corporation in the U.S. and/or other countries.